Having straight teeth is important for your self-confidence and for your oral health. Discover Invisalign® – the clear choice for a beautiful smile. Bite problems are more than an esthetic issue – they also influence the function of your mouth, and if left untreated, they can promote TMJ problems. Invisalign is a popular way to straighten teeth and deal with malocclusion because treatment is more comfortable and cosmetically appealing than traditional braces. At Mesquite Dental Smiles, the dentists and her staff are fully certified in Invisalign. Working with a special Invisalign lab, they will fit your teeth with a series of removable plastic aligners that will gently but effectively shift your teeth into proper position. Is Invisalign right for you? Call our office for you today. Invisalign® is an alternative to traditional metal and ceramic braces which use a series of clear, removable trays or aligners to move teeth into ideal alignment over time. The aligners are made of medical-grade plastic, and because they’re clear, they’re nearly invisible while being worn. 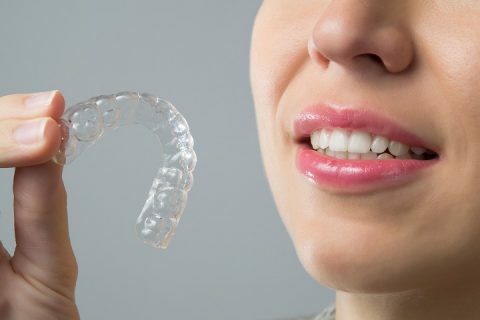 Invisalign® can be used to correct most alignment problems in both adults and teens, including overbites, underbites, crossbites, crowding and gaps. Is Invisalign® better than metal or ceramic braces? All types of orthodontic appliances can be effective in realigning teeth, but many patients prefer Invisalign® because of the benefits it offers. First, in addition to being virtually undetectable while being worn, the clear plastic aligners are also removable, making it much easier to care for teeth. Because they can be removed when eating, there are no dietary restrictions as there are with braces that use wires and brackets. The aligners are completely smooth, which means they can be more comfortable to wear. Plus, since the aligners are created for each individual patient, treatment can often be completed much more quickly compared to braces that use wires and brackets – usually within 18 months or less. Treatment begins with a series of impressions or molds of the teeth. These impressions are sent to the lab where the aligners will be made. Once at the lab, the impressions are scanned into a computer that uses special software to create a series of detailed three-dimensional models of the teeth, showing the movements they need to make to come into alignment. The aligners are made based on those models. During treatment, each aligner will be worn for about two weeks before being “swapped” for the next aligner in the series. Office visits take place about every six weeks to make sure the treatment is progressing well. The length of treatment will be based on the individual patient’s needs.